The engines that conducted Florida’s wild SEC Tournament run finally ran out of steam- and into a zebra-patterned brick wall. Auburn defeated Florida, 65-62 in the SEC Tournament semifinals thanks to an inexplicable non-foul call in the final seconds. The Tigers’ Jared Harper was shooting a free throw with :06.2 showing on the clock, but he missed it just to the right and the Gators had one last chance. The ball found its way to yesterday’s hero, freshman Andrew Nembhard, who was promptly battered before he could even get a shot off by a trio of Tigers. No foul was called, and that was that. But while the officiating may have cost Mike White’s squad the game in the end, the Gators didn’t exactly help themselves, either. 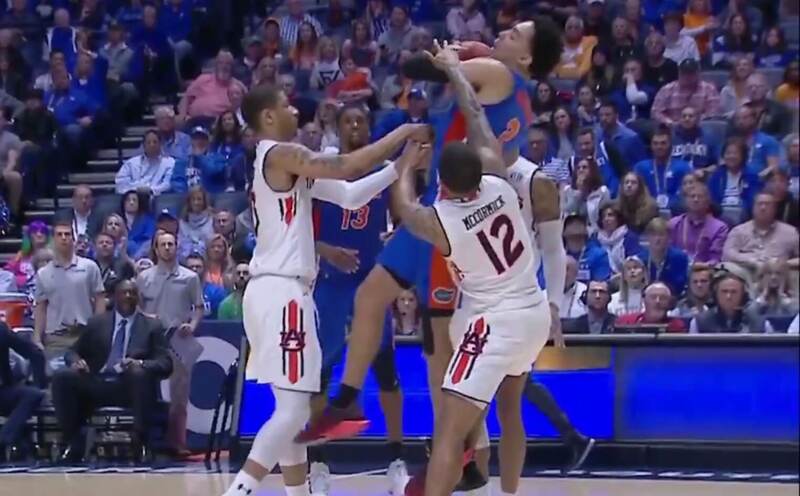 There was no explosion from Andrew Nembhard, KeVaughn Allen or Keyontae Johnson this time, as the three driving forces of the Gators’ improbable run to the SEC Tournament semifinals finished with a total of eighteen points. Making matter LSU worse, Florida committed an astounding 20 turnovers in the ballgame, a large part of the reason that they only got off 38 shots in the ballgame- a stat that includes a few stray dunks and putbacks as well as Nembhard’s desperate attempt in the final seconds. By contrast, Auburn put up 56 shots. More than half of them were threes, and thirteen of those went down- the most the Gators have allowed in one game all season. On top of that, Kevarrius Hayes let three different passes intended for him in the paint slip through his hands without Auburn’s contention- six potential points lost depending on if he could have finished the play after catching the ball. Despite its penchant for self destruction, Florida only trailed 61-55 with 3:09 to go. The Gators managed to stop giving out goodies long enough for Jalen Hudson to hit a three, and Hayes followed that up by finally securing a pass down low and flushing it down to cut the lead down to 61-60. Then it was Auburn’s turn to give it away, as Chuma Okeke failed to get the ball across midcourt within ten seconds. But Keyontae Johnson subsequently decided the Gators needed a three with forty seconds to go, and Harper drilled a three. Hudson immediately cut the lead in half with a driving layup, and Florida promptly fouled Harper to extend the game. Then came the miss, and the fateful no-call. But in a cosmic sort of way, the officials’ collective dining on their whistles might have actually helped Florida. The Gators locked up an NCAA Tournament berth with yesterday’s win over LSU, and another win today would have helped that seed of theirs climb higher. In the particular situation Florida is in, though, it might be best to be careful not to climb too high; there’s obviously a cap on just how many seed lines the Gators could scale their way up to. Even if Florida had beaten Auburn today and then Tennessee tomorrow, there’s no way the Selection Committee would rank them as any higher than an 8 seed given their fourteen losses, and probably not even that high. This is where it’s critical to remember that the winner of the 8-9 matchup in the first round draws one of the four best teams in the nation in the second game, and so it’s actually beneficial to hang back and get a 10 or 11 seed to avoid the Regional one seeds. In any case, Florida is now left to sit back and watch the Selection Show tomorrow like everybody else. Thankfully, they’ve done enough for themselves that they’re merely watching to learn their seed, opponent and location. And given where this program sat some 50 hours ago, that’s certainly something to be proud of.